If you haven’t seen Low Cut Connie live show yet, you should. There is not too many bands out there that put such a fun, carefree show. They would surely prefer to have a full house, but even if there’s an audience of five, they’ll knock the house down. Adam Weiner carries upright piano to every show and it’s gotta be a hell to tune it while on tour, but that piano is a key instrument in the band and some synthesizer just won’t do. Weiner shares song writing and vocal duties with an Englishman Dan Finnemore. Dan sings in a flawless american accent though. The band will sometimes rotate not just vocals, but also instruments at their live show and in short, it’s the hardest working band out there on the tour. Excellent sense of humor will keep a smile on your face and upbeat tunes will keep you on your feet. Their record Call Me Sylvia is in that sense an excellent representative of their live shows. Wild, unbridled atmosphere did not get lost in the studio. Chatter of the background singers was not taken out of the mix and sometimes you will feel that the band members also called in their friends to help with the hand-clapping. 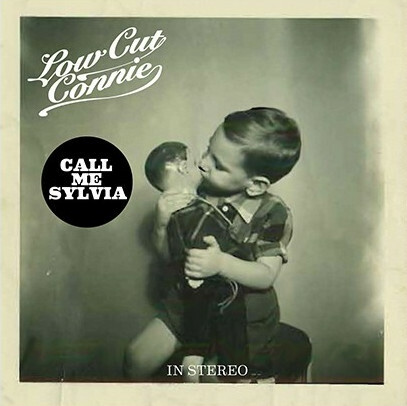 It’s never generous to represent some band as “this” meets “that”, but I cannot resist to say that Low Cut Connie sounds like Replacements would, had they decided to make an LP with Willie DeVille. And their live music enthusiasm can only be compared to the shenanigans one can see at The Fleshtones gigs. And of course, Weiner’s piano acrobatics and his ruffled bangs rightfully often draw comparisons to Jerry Lee Lewis. Clevelanders should get a kick out of the song Cleveland, which is a hilarious story of a suicidal male stripper returning to his hometown after a failed career, perhaps in some bigger town, like New York City, which is where Low Cut Connie are based in. Call it black humor, but as a Clevelander, I am proud. That’s a Weiner’s song, whose writing is generally humorous, ironic and cabaret, while Finnemore’s tunes are generally more melodious, no-frills rock’n'roll tunes about cars and girls. Although the record was originally published as a CD in 2012, the vinyl release saw the light of day in 2013. That and the fact that I got a hold of the record only in December last year, qualifies it for consideration for one of the best albums in 2013. The outer groove of the record indicates that the vinyl master was done by Joe Lambert at JLM and the vinyl sound overall is pretty good. It is wide and spacious, although slightly heavy on high frequencies, but that’s just my taste. I fixed it with an easy adjustment on my equalizer. I am not sure what pressing plant was used, but that factory could pay more attention to the quality control – B side of my copy has a slight eccentricity and some wobble due to it.